If you think that the best you can do on Sunday is sleeping, then you couldn’t be more wrong. According to Shalom Lloyd, to achieve the “impossible”, you should start with doing the “necessary”: so, getting up. Then you must do the “possible” until you finally realize you’ve achieved the “impossible”. I spent Sunday 27th May, for instance, in Nuffield Theatre having a delightful and unforgettable time while learning some valuable lessons presented by incredible speakers. This conference was organised by the dedicated TEDxLancaster U team. For those of you who somehow don’t know what TED is: TED (Technology, Entertainment, Design) is a media organization founded in 1984, which holds an annual conference under the slogan “ideas worth spreading”. Those “ideas” are posted online in the form of talks for free distribution. Even though TED’s emphasis was originally on technology and design, underlining its Silicon Valley origins, nowadays it has broadened its focus to areas such as science and culture. TEDx run independent TED-like events, organized by volunteers from various local communities. Just like the original TED, TEDx lacks any commercial, religious or political agenda. Its aim is to inspire conversation, connection and community. 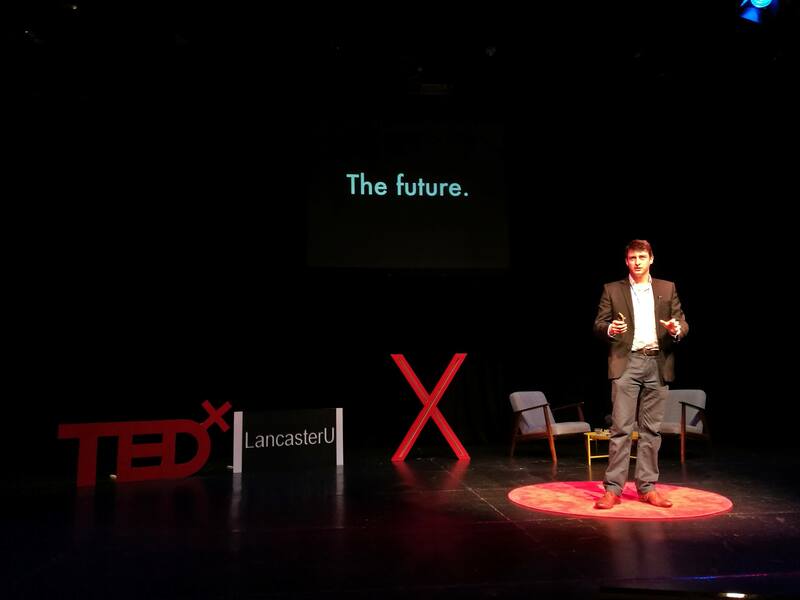 Thanks to Lancaster University students, who a few years ago asked themselves “Why don’t we have TEDx?”, this one and only experience came to our university in 2012. Since then, more and more students, lecturers, staff and individuals cooperate to support “ideas worth spreading”. This year’s conference theme was “The Future is Now”, aiming to explore “how we as human beings shape our presence and how it determines our future”. On the one side the Age of Information, with rapidly developing technology, offers opportunities that were previously unthinkable and unimaginable. Yet, on the other side, in the Age of Information people lose contact with other human beings, distancing themselves and escaping from reality into the modern forms of simulacrum. TEDxLancaster U managed to gather nine outstanding speakers from a wide range of disciplines, from genomics to dance, who took the audience on a fascinating and thought-provoking journey. Let’s start from the end. The inspirational Shalom Lloyd, founder of Naturally Tribal Skincare Ltd., finished with the “possible impossible” talk I mentioned at the beginning of this article. With the use of a quote from Francis of Assisi, Lloyd presented on the way of thinking and lifestyle she believes useful to achieve the “impossible”. The theme of “achieving the impossible” was visible throughout the conference. Dr. Velislava Petrova presented a straightforward, yet intriguing introduction to genomics and the rising question of the economical worth of our genes. Kevin Turner, an artistic co-director, delivered a passionate, intimate and moving talk about the transformative power of the arts, focusing on dance and mental health. In another charismatic talk, Dr Simon Clark, an academic and YouTuber, explored the concept of video blogging in the age of hyperreality, half-truths, verisimilitude and constant media consumption. Clark was interested in the interplay between online videos and society, and the changing ways people interact with the media, and he also managed to touch upon the possible educational formats of vlogging. Furthermore, Joanne Roxburgh focused on virtual reality and its role in education. The sense of presence evoked by virtual spaces, she claimed, enables virtual spaces to be treated as teaching spaces which can help skills develop within the illusion of “real situations”. Hence, Roxburgh encourages everyone to “plug in and switch on”. Dr Saskia Vermeylen, a legal scholar, explored the seemingly futuristic topic of space law, which doesn’t belong only to science fiction anymore. Vermeleylen’s talk was particularly fascinating as the new era of space exploration is not due in a matter of years or decades, but months. So, fitting this year’s theme – the future is indeed now. If someone asked me what I learnt at TEDxLancaster U, I would either present a long and passionate list or would simply ignore the question and summarise the conference in one word: inspirational. I take my hat off to the organizational team who put in such phenomenal effort in order to bring out the best of the very soul of TEDx. To see fantastic theories performed on stage by charismatic speakers, you yourself should go and experience the “ideas worth spreading” when they come to Lancaster next year.